Many, Many Thanks to you for all you do! 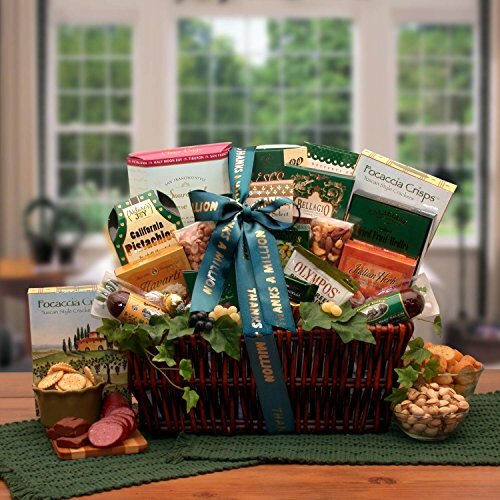 That's what you are trying to convey when sending a thank you gift and the Many Thanks Gift basket is sure to express your sincere thank you upon opening it. The custom thank you bow is just the right touch to express your sincerest thanks. The Many Thanks! Gourmet Gift Basket includes: California pistachios, Havarti cheese spread, 3 oz Bavarian beef salami, 3 oz Bavarian summer sausage, Creamy Italian Herb cheese spread, Focaccia parmesan crackers, Chamberry harvest fruit & nut snack mix, Olympos pimento stuffed Mediterranean olives, Chamberry French truffles, Lindor white chocolate truffle, Ghirardelli caramel square, Ghirardelli mint filled milk chocolate square, deluxe assorted nuts, English select tea, honey sweet peanuts, smoked almonds, Toffee and chocolate covered cookies, Biscoff European butter crisp cookies, classic dark stain willow tray. This gift measures 13" long by 10.5" wide 13" tall weighs 6 pounds, is wrapped in cellophane and is completed with a hand tied Thank you bow and sash.